Could It Be? Well, Maybe Not. So ... "Boxers or Briefs?" "Your Family Coat of Arms"
Which is all fine and good; I'm always glad to see people using heraldry, even if in some fashion that may not be something that I would do personally. 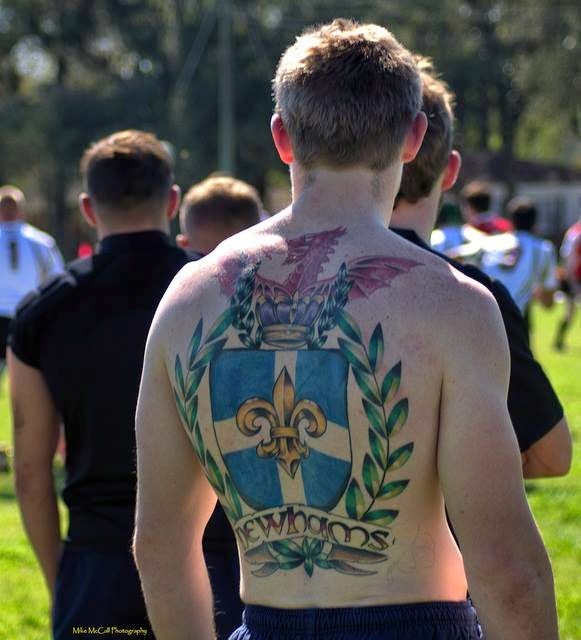 And then I recently ran across on-line the picture below, of a young man who must really, really like his heraldry. Unfortunately, I've been unable to track down this coat of arms in any of the usual places (Burke, Papworth, Rietstap). I'm left with a lingering suspicion that he may have gotten the image from some bucket shop herald somewhere, which would be a shame. Because if you are going to do something like that to your back, it would be nice if it were a coat of arms which you were actually entitled to bear (or in this case, "bare"). Still, you have to admire his moxie for getting it done like that! I've met a lot of people with CoA tattoos they recieved from bucket shops or from online image searches. A couple of them were upset and became hostile and defnsive, most shrugged it off , and only one has made efforts to adapt the coat of arms to be his. Ive juggled the idea of getting a tattoo of my arms to add to my collection, but I have not found a tattoo artist who can give me the level of craftsmanship I desire.